Jackson Cardwell was burnt badly by his ex-wife who did everything to destroy him and take away his son. Now bitter of women and gun shy of love, his verdict is still out regarding his brother Tag's soon-to-be bride. In town for his brother's marriage, he is soon entangled in the mysterious incidents that keep happening to the wedding planner, Allie Taylor. Allie is afraid of losing of her mind and eventually her daughter. Ever since her husband's death, she keeps forgetting things and keeps feeling her dead husband's presence in her home. Are people correct in suspecting that she is losing her mind? Jackson feels protective towards Allie and is sure that someone is hell bent on making Allie believe that she is going mad! I love B.J Daniels books. Each one is different from the other and totally entertaining. Wedding at Cardwell Ranch is the second book in the Cardwell Cousins series and tells us the story of Jackson Cardwell, the bitter and over protective single father who is distrustful of females. 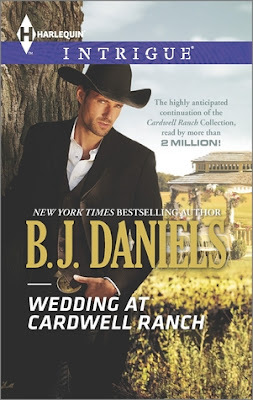 If I adored the first book in the series, Rescue at Cardwell Ranch then I absolutely loved this book. The plot is expertly conceived and carried out. The author has used the concept of Gaslighting which gives the story a very creepy effect at places. I could feel hair at the nape of my neck stand up while reading the book. BJ's writing style is engaging and simple. I was intrigued and stuck to the book right till the very end. I just had to finish the book in one sitting. The characterization is beautifully done. We are introduced to Jackson, Allie and a number of other characters including Allie's husband's family. Allie's mother-in-law still blames Allie for all her son's mistakes and his death and is trying her level best to take Allie's daughter away from her. Then there is Allie's brother-in-law who is trying to fill his dead brother's shoes and is making Allie uneasy with his sometimes over possessive and territorial behavior. There are a number of other suspicious circumstances and people that makes this book a great brain teaser. The chemistry between Allie and Jackson is instant and very sensuous. Jackson feels protective towards Allie and Allie feels safe and sane with Jackson. As usual, I loved the Cardwell clan and loved the whole wedding atmosphere. The story is fast paced and throws unexpected twists and turns to bewilder the reader and keep him guessing the identity of the perpetrator till the end. The mystery when it unravels is sure to surprise and shock you. I loved the whole gaslighting concept used in the story and enjoyed reading the book. A perfect mystery to solve, this is a must read. 4.5 out of 5 to Wedding at Cardwell Ranch . Go read this book and enjoy! I received the book from NetGalley and the publishers, Harlequin and I am very thankful to them. The above review is my honest and unbiased opinion and in no way influenced.